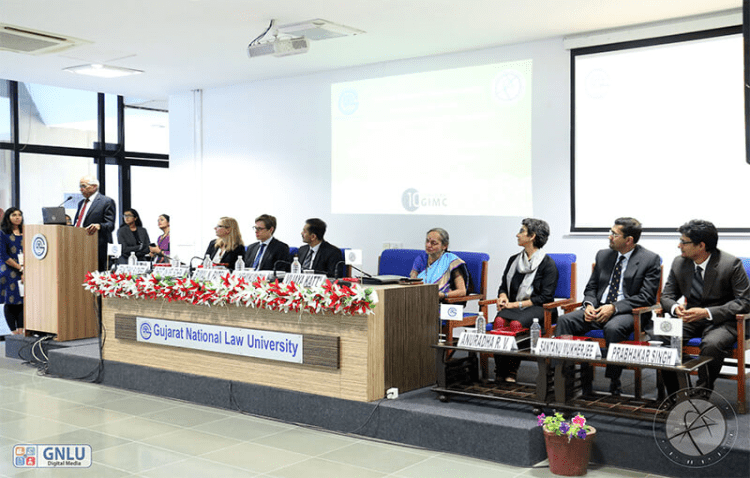 For a decade, GNLU International Moot Court Competition (GIMC) has provided a unique platform for discourse on contemporary issues in International Trade Law by simulating the WTO Dispute Settlement Mechanism. With each passing edition of GIMC, we strive to engage teams in spirited, yet challenging competition, and help them realize their passion for this field. The 10th edition of GIMC was successfully organized in collaboration with the Food and Agriculture Organisation; IELPO LL.M. Programme, University of Barcelona; World Trade Institute, Bern; Lakshmikumaran & Sridharan Attorneys, Lex Witness and Manupatra. It witnessed enthusiastic participation from more than 50 teams from across 10 countries. Given that recent changes in international relations and conduct of trade have far-reaching impacts, it has become more pressing now than ever for law students to possess a comprehensive understanding of International Economic and Trade Laws. GIMC helps build this understanding among students. Gujarat National Law University cordially invites you to the 11th edition of GIMC, to be held from February 13-17, 2018. The Winners and Runners-up of the 11th edition along with other prizes, will receive a cash prize of INR 50,000 and INR 25,000 respectively. Cash prizes and other awards will also be conferred on the Best Orator (Final Rounds), the Best Orator (Preliminary Rounds), the Second Best Orator (Preliminary Rounds), the Best Memorial, the Second Best Memorial, the Best Researcher and the Second Best Researcher. Last day for provisional registration: October 8, 2018. Last day for registration and completion of all formalities: October 22, 2018. Last day to apply for clarifications regarding the Moot Problem: November 23, 2018. Clarifications, if any, to be published: December 2, 2018. Last day for submitting the soft copy of the Written Submission: January 13, 2019. Last day for submitting the soft copy of the Written Submission for Indian Teams: January 18, 2019. Last day for submitting the hard copy of the Written Submission for Foreign Teams: January 25, 2019. Dr. Girish R., Faculty Convener at [email protected], +91-8128650806. Ms. Surabhi Saboo (Communications Coordinator) at [email protected], +91-7574840646. The Official Schedule of the Competition is available here. The Moot Problem is available here. The Registration Form for the moot is available here.